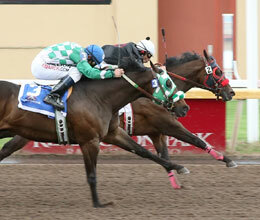 Specials Jamie defeating Nash Wagon Special in the FL Lady Bug Stakes at Remington Park. OKLAHOMA CITY, OK�MAY 25, 2014�The 2-year-old stakes event for Oklahoma-breds on Sunday at Remington Park went to Specials Jamie as she handled 330 yards in :16.635 seconds under jockey Agustin Silva. Owned and bred in Oklahoma by A.C. Taylor of Seminole, Okla. and trained by Kasey Willis, Specials Jamie held off a late charge by Nash Wagon Special to win by a head. BP Down South was third, a half-length behind the runner-up. Away at 6-1 odds in the wagering, Specials Jamie paid $14.40 to win, $5.80 to place and $4.40 to show. Nash Wagon Special paid $12 to place and $10.20 to show. BP Down South returned $2.80 to show. PYB Place Your Bet was the beaten 4-5 betting favorite, running fifth after a slow start. Specials Jamie won her second career race. She won her trial and qualified for the Remington Park Futurity in April, only to run last after being fractious prior to the start. A filly by IVORY JAMES from the Make It Anywhere mare Special Anywhere, Specials Jamie made $44,538 to run her career total to $75,176. Nash Wagon Special earned $14,846 for owners Randy Davis and Lloyd Rambo. Tana Pace saddled the gelding with G.R. Carter, Jr getting the riding assignment. Bill Price's homebred Bp Down South finished third for trainer Eddie D. Willis. Oscar Reyes was aboard the filly. Oscar Reyes had the riding call to earn $8,165. Completing the field were Awesome Ashley, Pyb Place Your Bet, Really A Corona, Pimp My Wagon and Jo Chrome. The FL Lady Bug Stakes is named in owner of the foundation broodmare who was responsible for the victorious runners of noted owners/breeder Marvin and Lela Barnes of Ada, Okla.